"Penny for Your Thoughts Wreath"
We wanted to create a unique ornament without spending much... so we came up with this ornament that used our ribbon scraps, some glue, and 14 pennies! My child and I created this ornament together. It was fun to do together. He placed the pennies in a circle and I glued them in place. We made a circle with 7 pennies (each with a little space between). The additional 7 pennies were layered over it, filling the spaces. 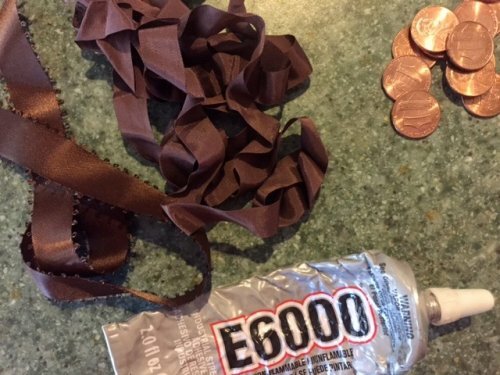 Perfect the placement of your pennies, and glue in place. We used E6000 glue, as you can see from my supplies photo. It was what I had on hand, and it held tight! (I tried this project with the glue gun, but it did not hold). Once dry, we tied a loop for the hanger, made a bow, and added it to the front. 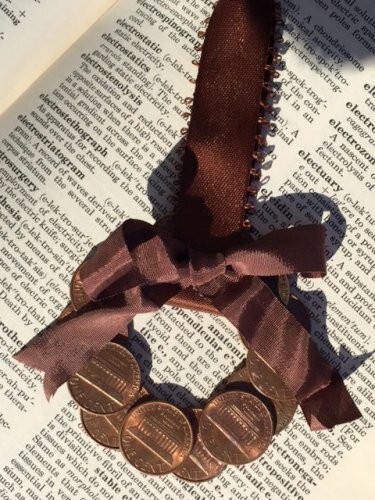 This would be beautiful in colorful ribbon, but this was the left-over ribbon that I had on hand, and I liked how the brown ribbon brings out the patina of the pennies a bit! Additional Notes: This project could be used with all different shades of pennies, or by collecting ones with similar patina. I have started collecting pennies from the year of my child's birth, so I can make him his own special penny wreath with his favorite color as the ribbon. 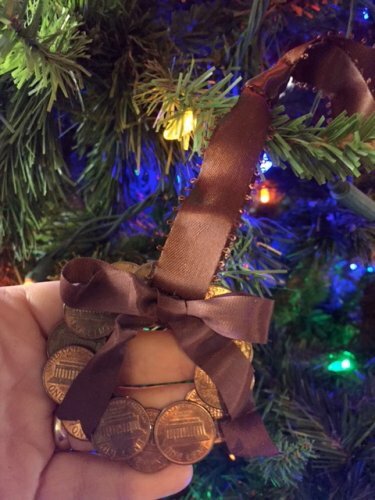 It would also be fun to use foreign coins from a vacation, bringing more memories and personalization to this simple wreath ornament!